These High Performance Resin Cases, made in Italy and constructed from Plaber's proprietary TTX01 compound, offer 'exceptional resistance to shock, corrosive substances, water, dust and weather'. They are used by photographers, broadcasters, emergency services, police forces and the military for transport of sensitive equipment and materials. The TTX01 compound is based on polypropylene and balanced with additional high-performance resins to make the cases lighter and stronger. 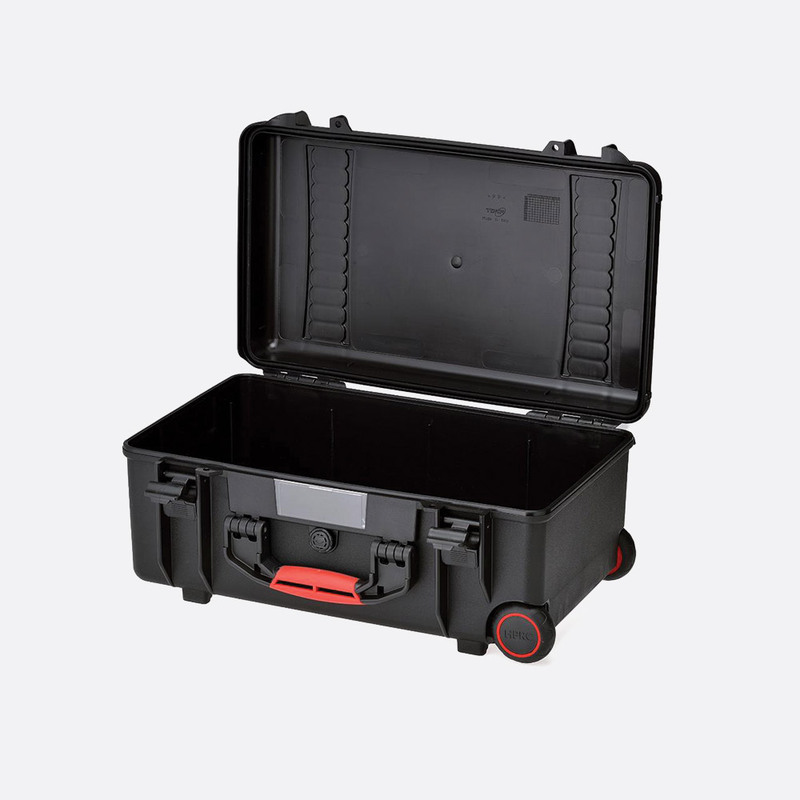 Cases have reinforced corners, rubberised, ergonomic handles and two-stage latches. Neoprene O-rings give protection to IP67 and 'Airex' automatic purge valves allow the exchange of air between the inside and outside yet prevent the entry of sand, dust and water. Hardware is stainless steel, wheels are made of PA66 nylon and polyurethane, handles polypropylene and SEBS polymer and latches are PA 66 Nylon. They are rated for temperatures from -40 to +80 degrees C. Approvals include: ATA 300, IP67, STANAG 4280, DS 81-4. Several case styles are offered. They differ in the number of handles and proportions of the two halves of the case. The cases listed are empty. They may be customised with a choice of accessories, including cubed foam, internal bags or dividers, depending on model. These should be ordered separately, see below. Front handle: On the side facing the user. End handle: On the left or right side. Sliding handle: On wheeled models, these handles slide out from the base, for pulling the case. Wheels: Wheeled models have a pair of wheels on the side of the case. Note (1): Internal. (2): Empty. 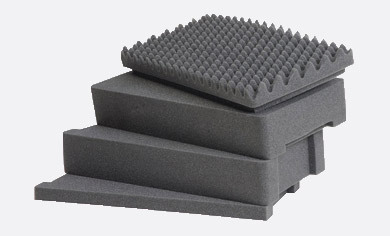 This consists of a sheet of convoluted foam for the lid and a multi-layered and cubed block of foam for the base. The cubed foam may be 'plucked' by hand to provide tailored housings to suit such as microphones, cameras, lenses and other delicate items. This is a zipped shoulder bag, shaped to fit the contours of the case. It may be lifted from the case and carried like a normal holdall or over the shoulder using an accessory HPRCStrap padded shoulder strap, order separately. The dividers are supplied as strips of reinforced padding, faced in 'loop' material, which may be cut to length as required and bent to shape. Each end is then wrapped with self-adhesive 'hook' tape, to attach the divider to the sides of the bag or other dividers. 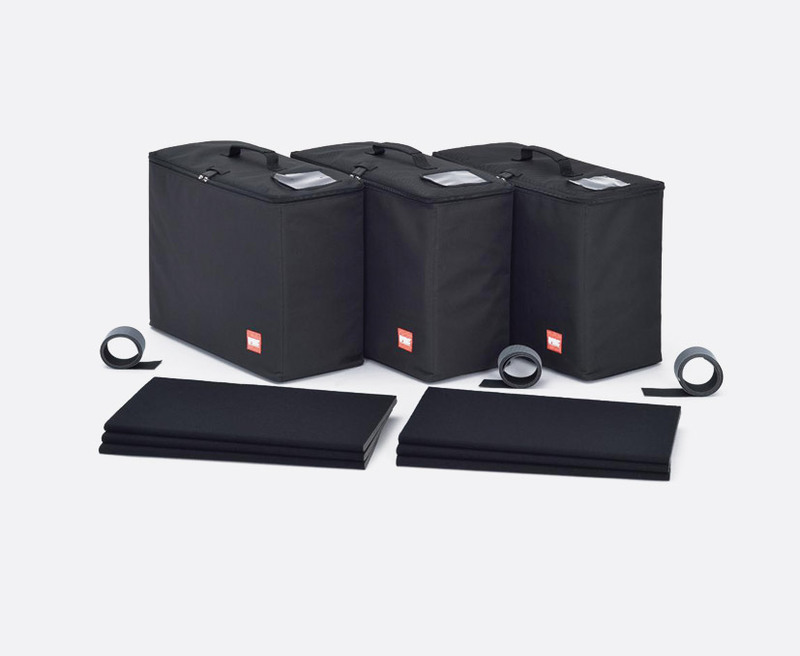 The bag accessory for the 5400W model consists of two long bags without dividers. 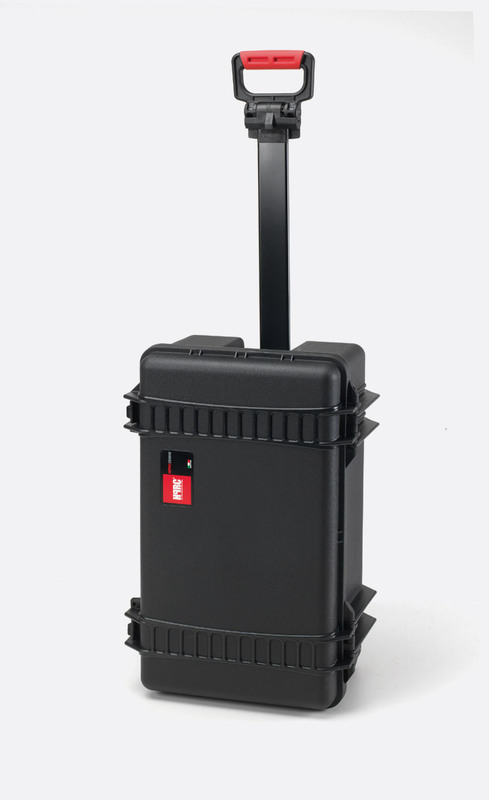 Suitable for transporting video, audio, electronics and photographic equipment, the soft-deck system is fitted to the case using 'hook-and-loop' tape. Self-adhesive 'hook' tape is fitted to the inside of the lid, base and sides of the case. The padding is pressed onto it; the surface is 'loop' material. The dividers are supplied as strips of reinforced padding, faced in 'loop' material, which may be cut to length as required and bent to shape. Each end is then wrapped with self-adhesive 'hook' tape, to attach the divider to the sides of the bag or other dividers. Either convoluted foam or a large, zipped pocket is provided for the lid. 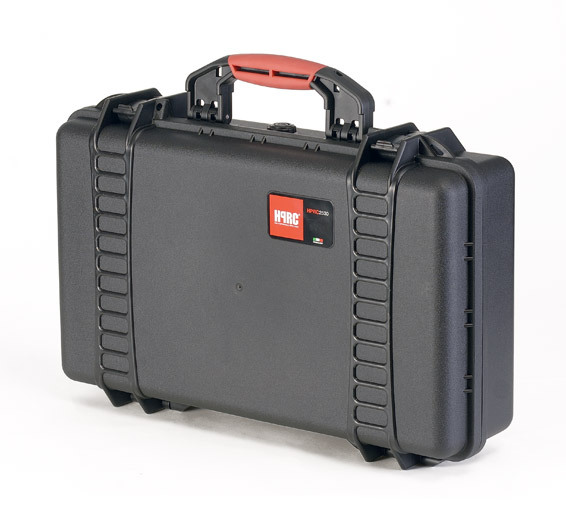 This protective modular insert gives more protection to equipment while maintaining the most usable space within the case. Designed from a lightweight 'thermoforming' material, the 'no-scratch' modular, customisable, dividers form a tighter 'second skin' that weighs less than the equivalent padded deck. Note: HPRCSSK2550W is compatible with HPRC2550W2017-EMPBLK not the older HPRC2550W-EMPBLK case. This fits in the lid of the case, to provide three, zipped, netting pockets, and depending on model, elasticated straps for small accessories. This kit may be fitted to selected models to provide a means of fixing a panel within the case. It consists of a frame, which is screwed into a recess in the inner surface of the case, and a sealing gasket. A custom-made panel can then be screwed to the threaded inserts in the frame, with the top of the panel just below the lip of the lower half of the case. The panel itself is not included in the kit. 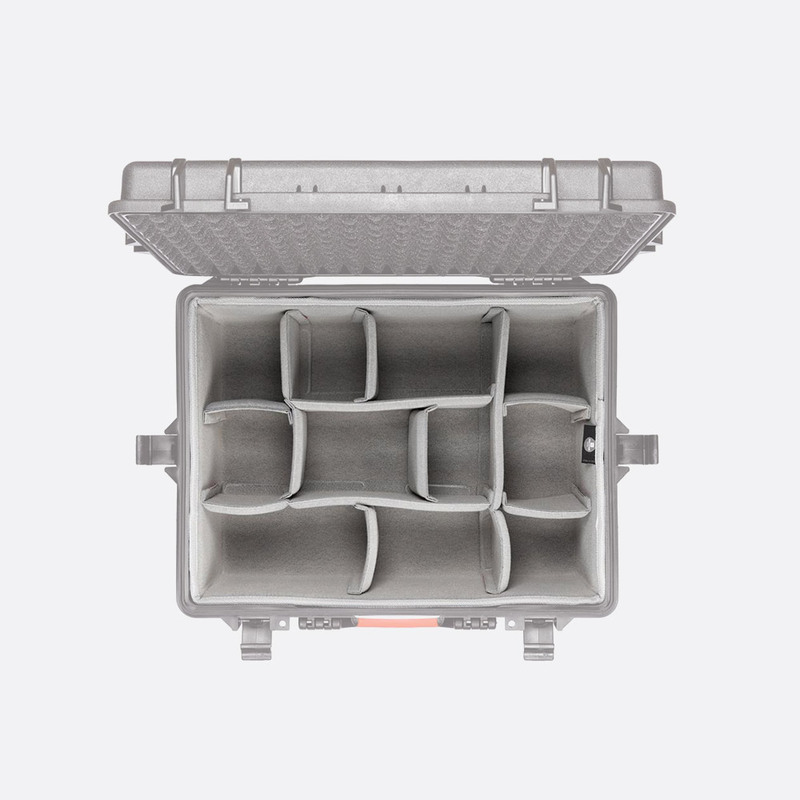 Used with the HPRC4400, this consists of four wheels on sleds which attach to the base of the case. A storage bag for the wheels is included. Two shoulder straps are offered. 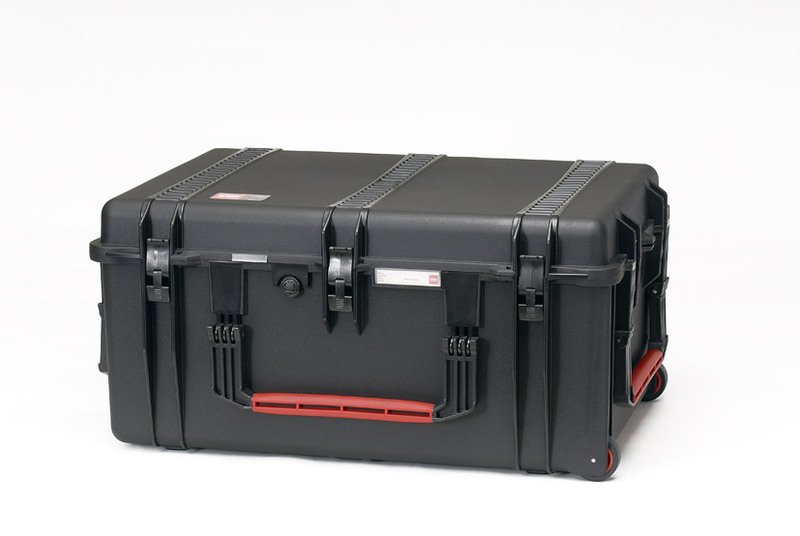 15-6697 is for the HPRC 4050 or 4100 'shoulder cases'; 15-6698 is for use with the Cordura Bag accessories (except HPRCCB5400)and the HPRC2580 and HPRC2530 cases. This fits to a standard 3/8th inch photographic tripod thread to provide a platform for use with laptops, projectors and other media devices. It will also hold HPRC cases up to HPRC2500, so that equipment may be operated whilst still in the case. Support arms slide out of the platform on all four edges and latch into position. Lateral supports hinge up from the arms to retain the equipment in place. Dimensions: 484 x 350 x 27.5 (w x d x h) mm, open; 394 x 280x 27.5 (w x d x h) mm, closed. Weight: 0.95kg.